French Dip Reviews: 5 of 5 DeliciScore™ (From Heaven) Awarded to Gere-a-Deli for their French Dip Sandwich in Anacortes, WA on this 26th day of September, 2011 - Adam's Gere-a-Deli French dip w/ cheddar: get a BOWL of jus! 5 of 5 DeliciScore™ (From Heaven) Awarded to Gere-a-Deli for their French Dip Sandwich in Anacortes, WA on this 26th day of September, 2011 - Adam's Gere-a-Deli French dip w/ cheddar: get a BOWL of jus! 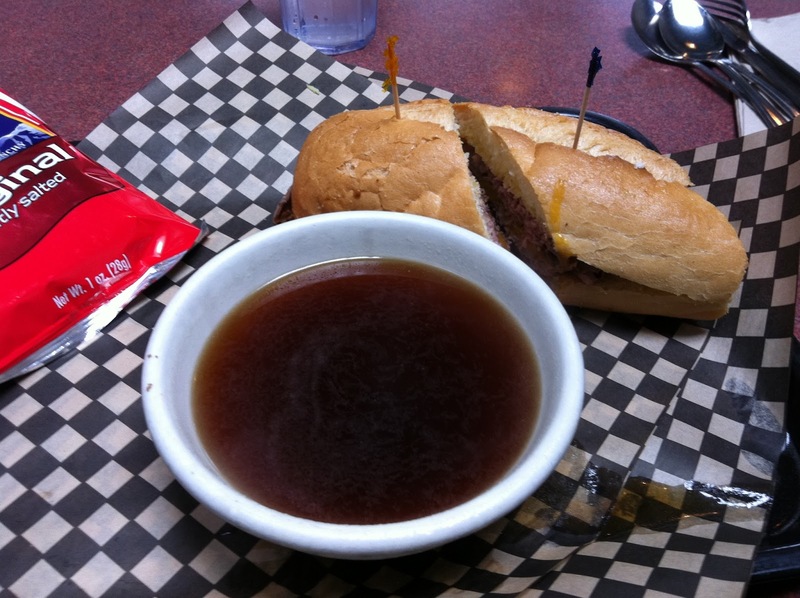 Gere-a-Deli's a great, popular, long-standing Anacortes staple. My brother, Adam, ordered a BOWL of jus to manage the risk of outage. Review: "Good bread, good meat, good jus, cheese was mild but pleasant, atmosphere nice, the previous sandwich [at Island Cafe] was larger and crispier. This was a solid product. 5."